If you have come across OfferBox on the web or onto your computer, you should know that there is no need to keep this application onto your computer because it is just a simple advertising-supported program which is ready to display a variety of advertisements on your screen. You might have downloaded this application from its official website offerbox.com or it might come on your system without you even noticing it. Have you noticed OfferBox and do not even understand how it could get on your system? If it is so, you should remove this application without further considerations. We will guide you through the removal process. As it has been mentioned above, OfferBox might have come onto your computer without your direct permission. On the other hand, you are the one who has agreed to install it. Do you wonder how it is possible? Actually, you have probably not noticed the message printed in a small font stating that other additional programs are going to be installed, if you do not un-tick the installation preferences. Do you want to avoid various unfamiliar programs? You should never skip the installation steps. Besides, you should always select the advanced installation. 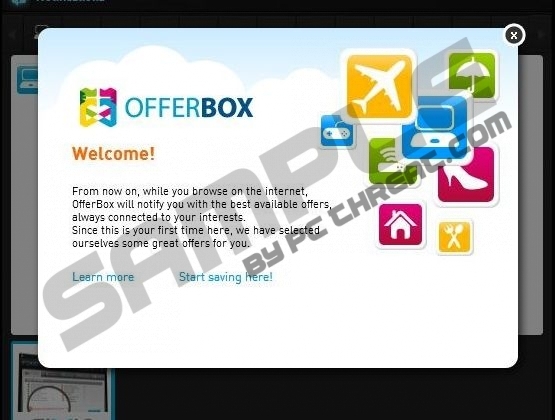 Even though OfferBox claims to be able to provide you with the best available offers while you are browsing the web, you should not trust this application entirely because you might experience more drawbacks than benefits related to it. It will not only display various deals and discounts in pop-up balloons, but also launch its own web browser. You should not click on any of those ads, if you want to keep your computer protected. We hope that you will choose the security of your system over those suspicious advertisements. Last but not least, it is very probable that OfferBox, just like other advertising-supported programs, might collect some of the non-personally identifiable information related to your browsing activities. If you still wonder why this information is collected, you should know that it is usually used to provide you advertisements based on your interests. It means that such information as your search queries and your overall browsing history is gathered and then shared with third parties. The only way to stop this is to get rid of OfferBox for a lifetime. You should better remove OfferBox, if you do not want to experience anything annoying. In order to make this process extremely easy, we have provided you with the manual removal instructions. Of course, there is a possibility to get rid of this application automatically. Acquire a reliable antimalware tool and scan your system. This tool will do all the work for you. Find and select the unwanted application. Move the cursor to the bottom-right corner of the screen. Type in “Control Panel” into the search box and click OK.
Quick & tested solution for OfferBox removal.